The 6 ft 3 in, 224 pounds Kopitar plays Centre and shoots left handed. Kopitar began playing for the youth team in 2002 for his hometown, HK Acroni Jesenice. In 2005, Kopitar was ranked the top European skater by the NHL Central Scouting Bureau. In the 2005 NHL Draft, the Los Angeles Kings selected Anze Kopitar 11th overall. Anze Kopitar Bobblhead Staples Center. Anze made his NHL debut with the Kings on October 6, 2006, against the Anaheim Ducks in Anaheim and scored two goals in the game. In January 2007, Kopitar was named to the NHL YoungStars Game. Anze recorded two goals and three assists in the hockey game. In 2007, Anze was awarded the Mark Bavis Memorial Award as the best first-year member of the LA Kings. Anze was also named Los Angeles the Kings’ Most Popular Player in 2007. On October 11, 2008, Anze signed a seven-year contract extension with the Los Angeles Kings worth $47.6 million. The 2010–11 season saw Anze Kopitar play in his 325th consecutive NHL game with Los Angeles, which set a new Kings team record. In the 2011–12 season the Los Angeles Kings won their first Stanley Cup as playoff champions. Anze finished 20 points from 20 games played in the playoffs. Anze became the first Slovenian-born player to win the NHL Stanley Cup. The 2013–14 season saw Kopitar lead the LA Kings in scoring for the seventh consecutive season. Kopitar and was named both the Los Angeles most valuable player and best defensive player. In the 2014 NHL playoffs, Anze led the entire league in scoring. March 31, 2016 Presented by Mercury Insurance. Anze Kopitar’s 26 points in 26 playoffs games. Helped the Kings won their second Stanley Cup championship in 2014. Anze signed an eight-year contract extension with Los Angeles During the 2015–16 season. Anze Kopitar 2014 Bobblehead Stanley Cup Champions. Made by Forever Collectibles. With the new contract, Anze makes an average of $10 million per NHL season until the end of the 2023–24 season. Anze Kopitar is currently ranked No. 13 in the Top 20 NHL Centers. Anze Kopitar NHL Awards and Honors. Stanley Cup champion 2012, 2014. NHL All-Star 2008, 2011, 2015. Frank J. Selke Trophy 2016. Lady Byng Memorial Trophy 2016. 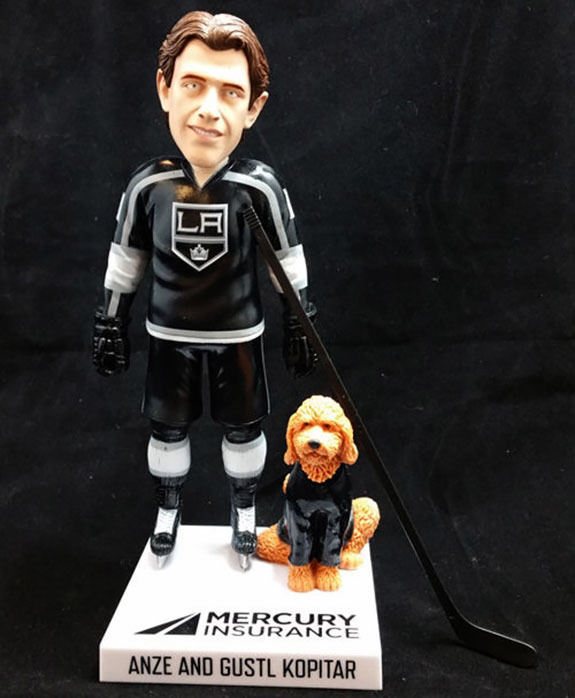 Anze Kopitar Bobblehead 2014 by Forever Collectible. The Mark Bavis Memorial Award in 2007. Most Popular Los Angeles Kings Player (2007, 2011). Kings Best Defensive Player (2011, 2013, 2014, 2015). Get 10% off Los Angeles Kings Home Game tickets marked BV. Use promo code ANZE at checkout! Some restrictions may apply. 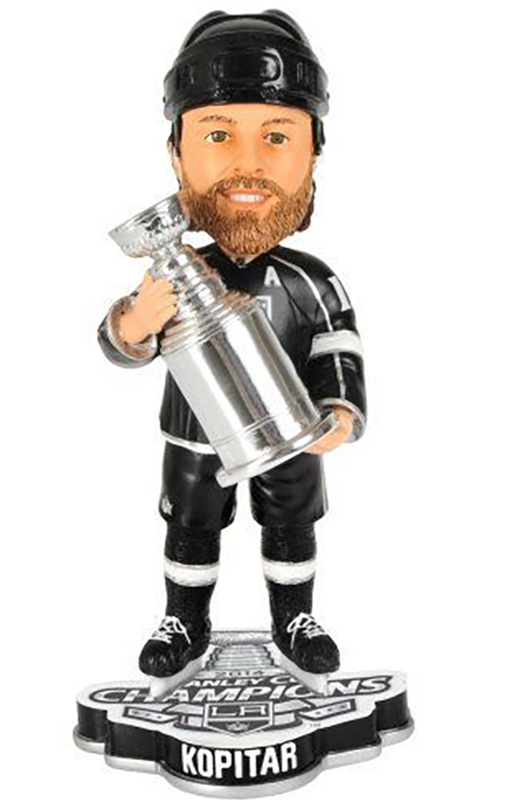 This season there will be four Los Angeles Kings Bobblehead Giveaway games at the Staples Center. Three will be featured in the Mercury Insurance series, and one is honoring the voice of the Kings for 44 years. The Kyle Clifford Zombie Bobblehead Night Saturday, October 14, 2017, at Staples Center. The Kings will face the Buffalo Sabres. Learn more about Kyle Clifford Bobblehead. Other Bobbleheads giveaways during the season will feature. The Tyler Toffoli Bobblehead giveaway game is on December 5, 2017, will feature him as an Elf. LA Kings Tanner Pearson Bobblehead will have the left wing don a green Kings uniform for St. Patrick’s Day March 17, 2018. Legendary Los Angeles Kings Announcer Bob Miller BOBblehead Giveaway Night is on Saturday, January 13, 2018, at Staples Center. You can check out more giveaways on our LA Kings Promotional Schedule for this season. If you need any help with your Kings Tickets , you can speak with Barry’s Tickets team member seven days a week at (866) 708-8499. Pingback: Can the Kings Win The 2014 Stanley Cup?